I will happily admit that I am obsessively addicted to the process of making paper and the joy of the final result. I like spending the time it takes to make a good sheet of paper. Because the process is so labor intensive I have a lot of time to consider my actions before I move on to the next step. I began my art career as a ceramics student but the first time I plunged my hands into a vat of fiber, I knew I had found my true medium. 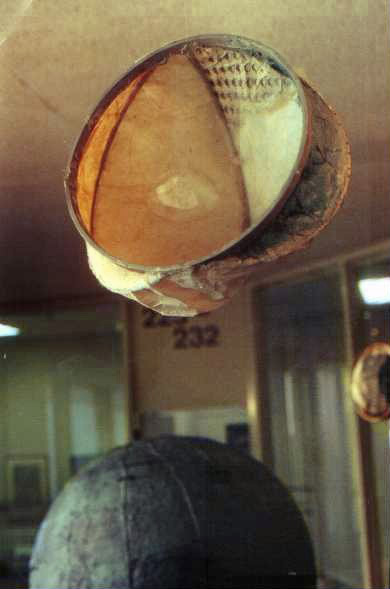 Clay had appealed to me because in the making, every inch of the material passes through one's hands. this is true of paper also. By covering wood with paper, I was able to achieve a clay-like feeling and gain the ability to build on a large scale. In the 80's I was unaware of anyone who was making art with paper on this kind of scale. "Rochelle" and "Gaudi's Left" are meant to be displayed together, portraying dichotomies such as heaven and earth, cold and warm, or touch and don't touch. I grew up in St. Louis, Missouri when the Gateway Arch was being built. This arch was much more interesting to me before the connecting section was in place. There was an electricity to the open space between the two half-arches as they reached towards one another. "Rochelle" and "Gaudi's Left" evoke that same spark for me. 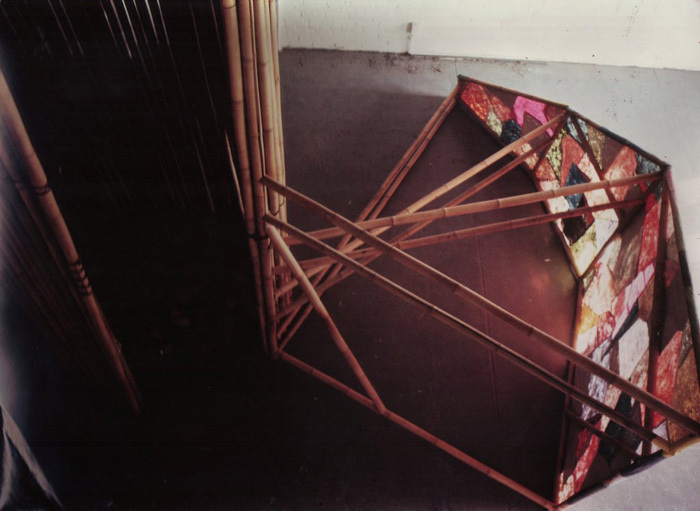 After building the 8' x 4' x 2 1/2' wooden armatures I covered them with multicolor pigmented cotton pulps. This vigorous process began by throwing the pulp into a delineated area and then patiently pressing with my hands from the top down. As lakes formed at my ankles, I thought about the remark my paper instructor Sophie Healy had made. She said something like, "When beating pulp, we are trying to get the water into the fiber. After making paper, we spend all our time trying to get the water out." Except for "Rochelle's" stairs, the interior and exterior of both pieces are pulp. The stairway is meant to be inviting, and when sitting on it one feels enveloped in cocoon-like protection. "Rochelle" is named after my printmaking teacher at Bennington College, Rochelle Feinstein. Her work taught me to relish decoration and not be shy about using it. I have always enjoyed small town parades with homemade floats and viewers were interacting with the work like it had that feeling. "Gaudi's Left" uses sky colors and tree shapes and is more ephemeral than its earth-toned partner. Within the sculpture one can look through a 10" x 6" window; inside is a fragile ceramic sculpture surrounded by a white gallery-like atmosphere. The title humbly refers to my quest to capture the feeling of Antonio Gaudi's "Sangrade Famila" in Barcelona. Gaudi's nature-inspired architecture influences the organic structures I make. I believe the use of clay tile on the the surface of his buildings is akin to the microscopic texture of pigmented pulp on my forms. 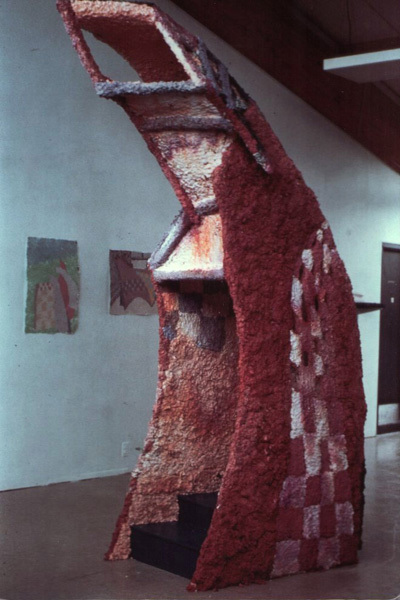 I am indebted to my sculpture professor, Winifred Lutz, who was supportive of my paper work in the graduate program at Yale School of Art.The fine art climate at Yale in the 80's was anti-craft, and my fellow students were not shy about voicing distainful opinions about work that looked "crafty". This art school anti-craft attitude was a bit of a shock to me. As a child I grew up in a studio atmosphere where the use of materials associated with craft for artwork was normal. My mother had supported our family by making and selling production pottery, then turned to making scupltural ceramics for galleries. 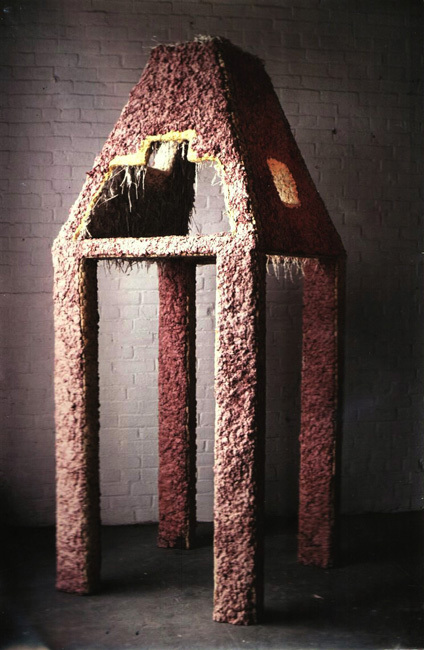 "Tower and Well" was an invitation to my peers to look at "craft" materials and processes in a new way. I sewed and glued many small sheets of handmade translucent paper together in the pattern of a crazy quilt. When backlit this "quilt" glowed like stained glass. 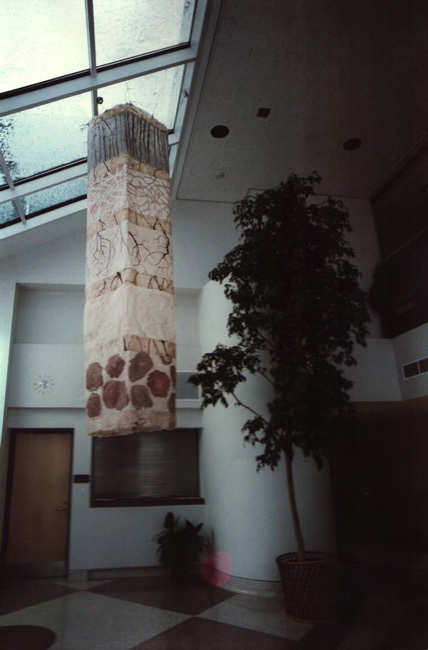 The bamboo tower was woven together with waxed cord and at the bases of the tower were ceramic tiles embedded in paper pulp. My goal with this sculpture was to bring together quilting, papermaking, stained glass, weaving, and clay into a single dynamic sculpture. The final work was about 12' tall and 14' wide which was the size of my studio. The only way I could photograph it was by climbing up into the rafters and shooting from a bird's eye point of view. "Shrine for Gaudi" was made with the assistance of Bec Whitehead when I was artist-in-residence at the Southwest Craft Center. 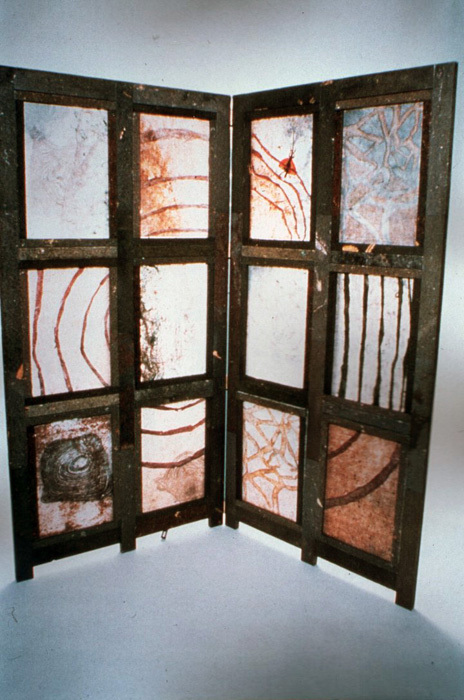 This 5' x 4' x 2' work incorporates welded metal, cast paper, clay tiles and wire. 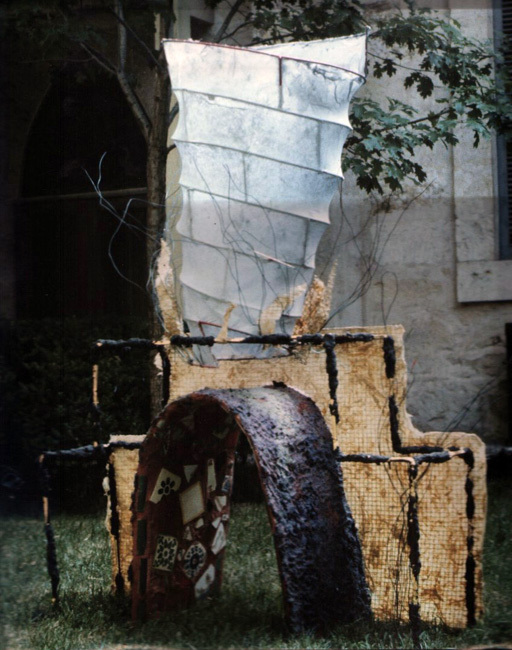 Texas was full of shrines and this residency was an opportunity to make one for Antonio Gaudi. Like Gaudi, I wanted to combine nature and architecture. His work has much movement and force so I picked a tornado shape coming out of a building with clay tiles. "Dogon" is a response to the material I was being exposed to in a seminar by Professor Robert Farris Thompson. The Dogon people were impressive because they spent all but their sleeping time out-of-doors. I wanted to make a sculpture one could stand in without much of a distinction between inside and outside. As the viewer moves around the exterior, color changes suggest different times of the day. Solid night-black is adjacent to yellow and orange sunrise colors. Next comes an orange "afternoon" with a little gray dusk intruding. The evening side of the structure is more closed, since this is a time when people are in their shelters. 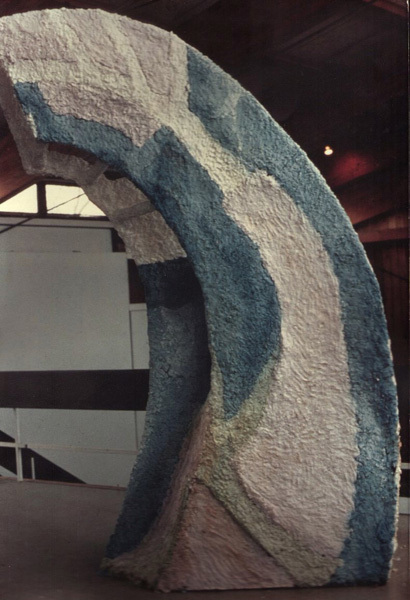 The interior of this 8 1/2' wooden sculpture is coated with plaster and hay. Similar to "Dogon", "Inner Bark, Inner Light" invites the viewer to experience the work from within it. Using imported kozo and gampi fiber grown and harvested in Taiwan and Japan made sense because of the way it holds the sunlight. To make this paper one uses the inner fiber, the strongest part of these plants, and the part I believe houses their incandescent spirit. The fiber is transformed by cooking it in a 15% soda ash solution. The cooking removes unwanted pectins and lignins leaving pure fiber which is rinsed, hand beaten, and made into handmade paper sheets, customised as my artwork requires. I made "Inner Bark, Inner Light" as a companion for the live tree that resides in the Music Building at Lawrence University in Appleton, Wisconsin. I make my own paper instead of buying it because, in the wet stage, I can pay attention to the relationship of the color, texture and thickness of each sheet. After it is beyond the wet stage and in the dry state I can draw or paint it with natural dye, sumi ink, beeswax, and oxides. "Winter" was inspired by living in Minnesota where we have a climate that is below freezing about five months of every year. One panel was made by using cooked but unbeaten kozo and saturating it in walnut dye, laying between white paper to direct the flow of the stain. Trees and snow are reduced to multiple shades of brown and white - there is beauty in this subtle palette. 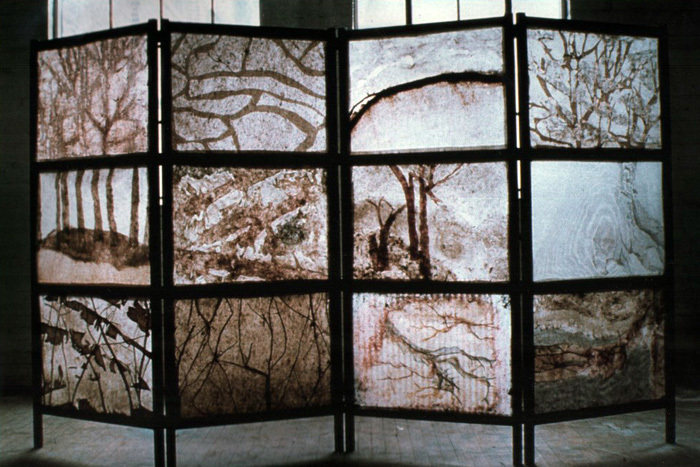 The frame for "Tree Book" was constructed by Stanley Shetka out of pulped, pressed, and discarded paper products. I like the idea of not using wood to make a frame for art which is emulating trees, and "Shetkaboard" (as Stanley calls it) seems to to be an ideal solution. This screen could be described as painting, drawing, sculpture, furniture, and even a book with twelve pages. Like quilting, each panel has to function individually and then contribute to the whole. Trees seem to have spirits which unite both the earth and sky. I hope this work visually nourishes and helps others and myself see and feel the ground and heaven. My current paper sculpture work includes performance and addresses a person's relationship to the universe. "Touch the Stars" has a layered indigo earth covered with black sparkling sand. The work is only complete when a viewer/participant interacts with it. Many viewers feel inclined to draw in the sand, look inside, or move one of the moons. 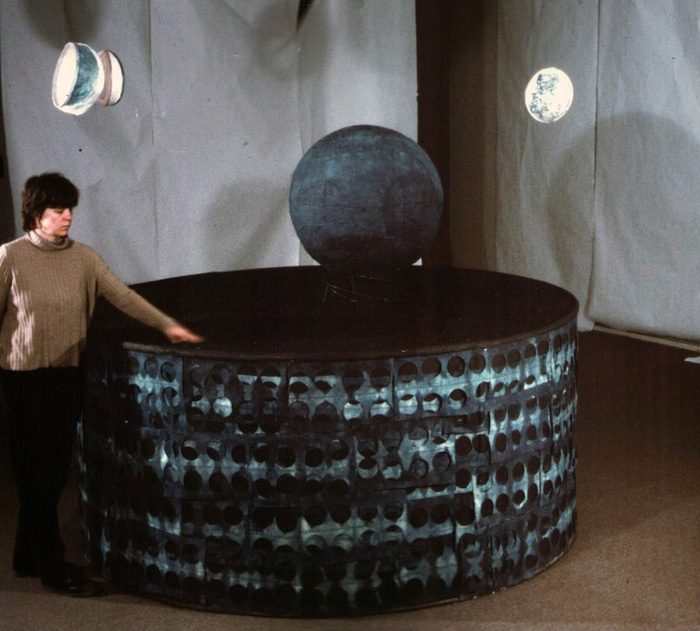 These welded aluminum and cast paper spheres can be interpreted as three moons, or as a single moon in three different phases. Hundreds of sheets of indigo paper with dye-cut circles are layered below the black volcanic sand. As the perforated blue paper overlaps on a black background, crescents, half moons, full moons, etc, are made. The moon influences the behavior of liquids, both in a person's body and the ocean's tides. This installation suggests that Man is a universe and is invited to be part of our environment. This installation work I have shared with you is not meant to stay in the world over a long period of time. I try to get as many people to see my work as possible and when it is over I recycle the materials. In this way I think of my work being more akin to theater than traditional sculpture. My gallery work includes pulp painted drawings, artist books, and editioned work. This work is often related to the sculpture and fills the void when I am waiting for permission to build. I have never tried selling these sculptures; they are my poetry.